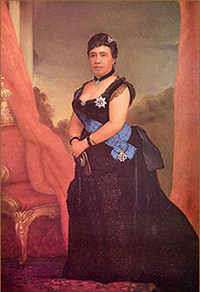 Queen Liliuokalani succeeded her brother upon his death on January 20, 1891. She was determined to strengthen the political power of the Hawaiian monarchy. Her attempts to affect change caused great opposition from the Committee of Safety, who later orchestrated the overthrow of the Hawaiian monarchy and the establishment of a provisional government with support of the American Minister to Hawaii. 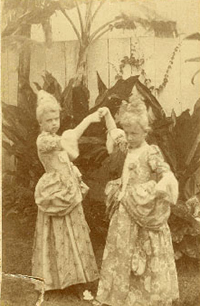 Photo: Else Schaefer and Bessie Lawrence in the costumes worn to the fancy dress ball for children at Iolani Palace. In 1895, an unsuccessful attempt by Hawaiian royalists to restore Queen Liliuokalani to power resulted in the Queen's arrest. She was forced to relinquish all future claims to the throne and was put on trial before a military tribunal in her own throne room. Liliuokalani was convicted, fined and sentenced to five years in prison at hard labor, which was later reduced to imprisonment in an upstairs bedroom of the Palace for nearly eight months.